It used to always be said that Burgundy was the most confusing and hard-to-grasp of all the world’s wine regions thanks to the bewildering number of small growers and its unpredictable climate that led to some startling vintage variation. Well, whether it is down to climate change or – more likely – the growers and winemakers simply improving their techniques to get the best from lesser vintages, that fabled inconsistency is really a thing of the past: year in, year out, Burgundy makes good wines with few really poor vintages, and many houses are ultra-reliable strongholds of very fine Chardonnay and Pinot Noir wines. But another factor has crept in that can still leave the Burgundy follower bewitched, bothered and bewildered: the profusion of sous marques, or in other words, separate brands, under which many companies sell their wines. In many ways this is an admirable attempt at transparency, to distinguish estate wines from the vineyards belonging to a great domanine from those made from purchased fruit, but the picture can sometimes be confusing. 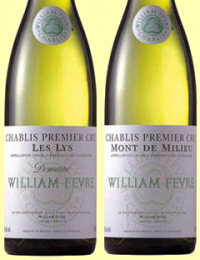 Chablis company William Fèvre is a perfect example: spot the difference in the two bottles pictured? The Word ‘Domaine’ is the only distinguising mark to say the wine on the left is estate-grown, the one on the right is a négociant wine. That may, or may not, indicate a quality difference, but different they are. The highly respected house Domaine de Montille also has a relatively new négociant range, focused on white wines, handled by the same winemaking team and made using the same facilities as the Domaine wines. It goes under the gloriously different sous marque of Maison Deux Montille – the ‘deux’ being brother and sister Etienne and Alix de Montille, the latest generation to have taken over the running of the 300-year-old family business in Volnay, succeeding their father, Hubert. 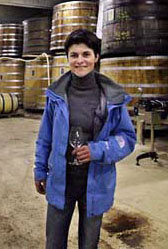 Alix de Montille (left) is in charge of white wine making for both parts of the business. Maison Deux Montille buys only grapes from local growers, not must or finished wine as is the practice with some négociants. They say these are sourced from growers with whom they have built long-term relationships, and picking is done by a team directed by Alix at the time she chooses. Whilst their growers supply fruit from some of the greatest names of the Côte de Beaune including Corton Charlemagne and Meursault, smaller but often very good surrounding appellations like Auxey Duresses, St Romain and St Aubin are a strong area of focus. These are very much ‘artisan’ négociant Burgundies. White wines predominate and all fermentations take place in barrel, with slow, cool fermentations using only naturally occurring yeasts. The wines stay in barrel for several months, with only a small percentage of the wood being new – from around 10% to 25% depending on the cuvée. Alix – also a passionate and knowledgeable cook and food expert by all accounts – is on record as saying she strives to make wines for the Deux Montille label of aromatic purity, finesse, length and intensity rather than size or weight. Certainly this snapshot of three of her 2008 wines from different appellations showed these as serious and very beautiful white Burgundies of great style. The wines of Maison Deux Montille Soeur Frère (to give the full name) are distributed in the UK by Armit Wines, who also retail them via armitwines.co.uk. The Armit price is given for each wine, along with other stockists. The 1er Cru Sur Gamay has a favoured southerly and easterly exposure, and this comes from 40-year-old vineyards at between 300 and 350 metres. With only 12.5% alcohol, this is crunchy and fresh, with a herbal edge to the apple fruit that gives it a green-hued, vibrant character. On the palate it rounds out, with a nutty character of English apples underpinning lemony fruit. Flirting with the austere, but with wonderful crispness and clarity too. Delightful. 90/100. £18.99, Armit. See all stockists on wine-searcher. Making only white wines, Pouilly-Fuissé is one of the top appellations of southern Burgundy, with clay and limestone soils. Again that modest 12.5% alcohol (as have all of the wines tasted here) but immediately showing more ripeness than the Saint-Aubin, though still sharply focused and fresh in the early-picked spectrum of aromas. More sweetness and ripeness on the palate too, but that is all realtive as this is still very much a wine showing pristine, cool fruit, the oak discreet and in the background, giving just a hint of almond in the long finish. 92/100. £23.24, Armit. See all stockists on wine-searcher. Les Vireuils is a lieu-dit on the eastern slope of the Meursault hill. The soils are primarily composed of white marl with a high proportion of limestone. Nutty, apple fruit dominates here, but there is nothing ostentatious about the aromas: it’s another pristine wine, just hinting at tropical fruit then little notes of dry, straw-like underripe apple. But this has such vibrant fruit as it hits the palate. It is fairly explosive but it is Meursault in the fine-boned, rapier-like idiom with just ravishing acidity. A lovely wine this. 94/100. £41.78, Armit. See all stockists on wine-searcher.